To combat the isolated silos in which traditional storage and infrastructure systems used to exist—often needing multiple admin consoles—some seek software-defined solutions to address these challenges. And now, businesses seeking software-defined storage (SDS) will soon have even more options from which to select in terms of server configuration. 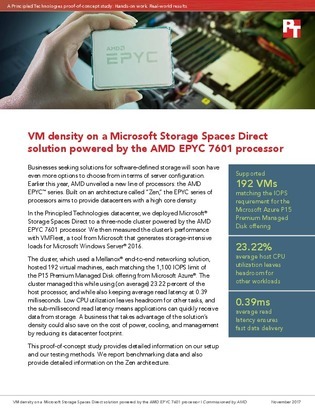 This Principled Technologies proof-of concept study presents the configuration of an SDS solution that uses Microsoft Storage Spaces Direct with servers powered by the AMD EPYC processor to provide a high core VM density. Read on for the solution’s I/O performance, and setup and testing methods.